The mission of Mystic Aquarium is to inspire people to care for and protect our ocean planet through conservation, education, and research. Our dive team is a group of volunteers who work both behind the scenes and in full view of our guests. 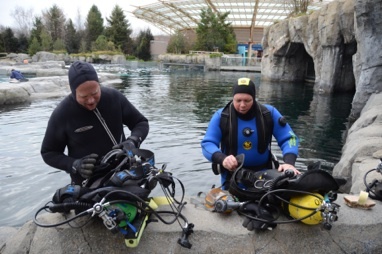 Each week divers must help maintain our exhibits like the 790,000 gallon Arctic Coast beluga whale exhibit or the 38,000 gallon tropical reef tank with 34 species of fish.